Scans - Which ones give true picture? 1-2-3 PLAN: (1) Cancer Treatment Core - "Cancer NOT Allowed!" There is a lot of negative coverage on Dr. Rath's Cellular solution, but this author is convinced that the research supports the therapy's authenticity and that the aggressive media onslaught may be a reaction to the therapy's success (usually, noone puts much effort into discrediting therapies that don't have merit). You should also be aware that 100% of profits from the sale of Dr. Rath Cellular Health Formulas go directly to the Rath Humanities Foundation to be used for advancing further research in natural health. Not that you need to buy the formulas anyway, since you can buy the therapy's individual components separately. In 1991, Dr. Matthias Rath found that the amino acid lysine, when combined with vitamin C, appeared to inhibit the action of protease - In 2002, he and his research team announced that they had discovered that adding the amino acid proline and an extract of green tea called EGCG stops the protease destruction of connective tissue collagen. (iii) EGCG (a catechin in green tea extract) is a potent anti cancer agent reported to have growth inhibitory effects against certain human cancer cell lines. See study for references. - Lysine and Proline - 2 amino acid building blocks for making collagen and elastin fibers. Lysine is also an effective enzyme blocker,preventing excess degradation of collagen by blocking sites where enzymes attach. The body makes proline in limited amounts, but it can not make lysine. - Epigallocatechin Gallate (EGCG) - A polyphenol catechin to aid vitamin C synthesis, found in green tea and available as an extract. EGCG has anti-mutagenic (prevents changes to DNA), anti-proliferative and anti-neoplastic (prevents formation of new cancer cells) properties, and is a powerful antioxidant. EGCG also stimulates detoxification systems (by selecting and modifying phase I and phase II metabolic enzymes). - Matcha tea - a high-quality, stone-ground, powdered form of select, shade-grown Japanese whole green tea leaves containing significantly higher levels of EGCG (~120mg EGCG per cup) than other green teas. However, heat can reduce EGCG benefits. Matcha can also be added to cold food or blender drink recipes. This author has found that quality Matcha tea can be purchased quite reasonably on ebay. Take Vitamin C as pharmaceutical grade ascorbic acid powder - When taking high doses of vitamin C, it is best taken as pure pharmaceutical grade ascorbic acid powder to avoid the unbalanced addition of the minerals in ascorbate compounds. 1. 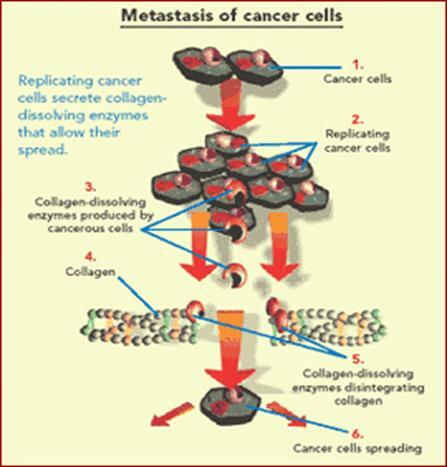 Stops the spread of cancer cells by inhibiting the action of protease -The”Cancer Cure”nutrientsact as "decoys" to neutralize the protease secreted by cancer cells, keeping it from destroying collagen in living tissue. This isolates the cancer cells preventing them from spreading. 2. Builds and strengthens your immune system -supplies raw materials for building healthy white blood cells, which can identify, surround, and destroy unhealthy and cancerous cells. 3. Contains two known selective chemotherapeutic agents - unlike non-selective pharmaceutical chemotherapies such as tamoxifen or radiation therapy, which are toxic to all cells in the body, these selective chemotherapeutic agents are only toxic to cancer cells. They trigger a mechanism called apoptosis (programmed cell death), but only in abnormal and cancerous cells, being perfectly safe to normal cells. 4. Contains antioxidants which act as a toxin "sponge mop" - often the cause of the cancer -toxic chemicals -are still present in the body. Also, cancer cells produce toxins (other than protease) that can destroy other cells. Antioxidants directly neutralize some of these toxins into harmless chemicals (which are then excreted), or help other detoxifying body mechanisms, such as in the liver. 5. Enables your body to quickly rebuild and regenerate the connective tissue collagen -that has been destroyed by the cancer cells. 6. Provides nutrients (vitamins and minerals) to help restore normal cellular metabolism - nutrients are often deficient in cancer patients. 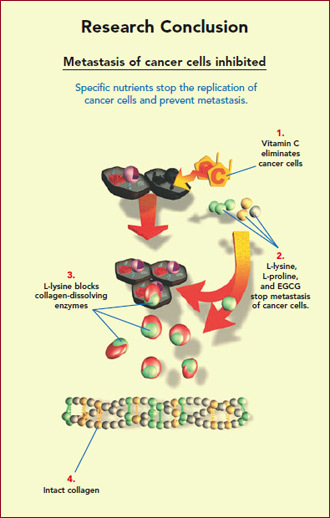 By itself, the Rath Cellular Solution has cured both brain cancer and bone cancer - according to testimonials(but they probably also included a controlled diet).Lysine, proline and vitamin C are also espoused by the two-time Nobel-prize winner Dr. Linus Pauling as the ingredients to prevent and treat heart disease by strengthening artery walls. (The Rath Cellular Solutionis essentially the therapeutic dose of the Rath/Pauling Therapy with extra proline + EGCG). Drs. Rath and Pauling worked on this together. (The Osiecki Cancer Treatment is a similar, but independently developed plan, with equal effectiveness). The regimen does not interfere with chemotherapy or radiation therapy - in fact, the vitamin C in the regimen reduces the side effects of these drugs by neutralizing toxins produced by their action in your body. What about other medications and INSULIN? - If you are currently taking a drug to reduce cholesterol - you will need to have your physician monitor your cholesterol count carefully and frequently when you start the natural therapy, since the regimen (through a different mechanism) also addresses the symptoms of cardiovascular disease. - If you are taking other heart or blood-pressure remedies (e.g., beta blocker, calcium channel blocker) - ask your doctor to carefully monitor the symptoms that these drugs are supposed to address, and taper off the dosage as your cardiovascular system becomes healthy again on its own. Why don't most doctors know about this therapy? - This therapy and other natural remedies for chronic illness are not known by most doctors because their primary source of information is the pharmaceutical industry and medical device industry, which have no incentive to publicize non-patentable, inexpensive, natural remedies or cures.